I think that this is probably the best nonfiction book that I’ve read this year. Seriously, that good. And it’s so prescient given the times that we live in. Throughout the world, it’s changing. I’ve said to my friends and family multiple times that it feels like we’re either in the 1930s or the Cold War all over again. And not in a good way. This time, it feels as if we’re on the opposite side. Since I’m an American, this is especially American-centric. Plus, this book is just focused on the political climate that just gets worse and worse every day. It’s to the point where I have no clue what news will come, but I can only guess that it’s going to be bad. I’m more shocked anymore when something doesn’t happen. Isn’t that worrying? That’s what this whole book is about, really. 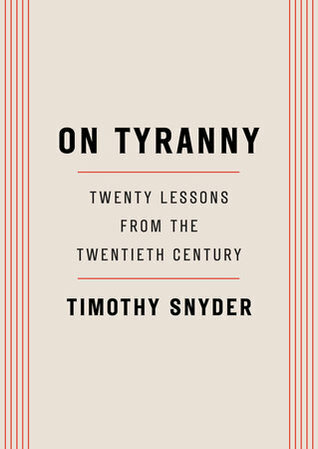 It’s very short, just over 100 pages, and it sums up 20 examples of things about tyranny and how to stop it in whatever country you live in. Again, this is focused on America. Along with the lessons, this book gives examples of when things are going wrong. From history and from America’s current political climate. In some cases, it gives historical examples of when it almost got to tyranny and how the people in the country stopped it. Mainly, it gives tips about what you can do to stop it. What you can personally do rather than just talking about a whole country’s uprising. Because the individual can do so much. I enjoyed this book more than I thought that I would. It’s impressive and it packs a punch considering how short it is. This is definitely a book I want to own a physical copy of just so I can reread it and annotate some.